Nice, but so what? Curiously enough, there's supposed to be a door there. It's on all the blueprints . . .
. . . and in the Orlando and Tokyo Mansions, there is a door there. Here's a side-by-side, with DL on the left, WDW on the right. It's supposed to have a clack-clack phantom knocker on it, and again, at Orlando and Tokyo, that's what you get. The answer is probably something mundane. Perhaps the door frame came out of the mold defectively, and there was no time or money to cast another one. (Like other HM fixtures, it's fiberglass.) So they had to improvise. 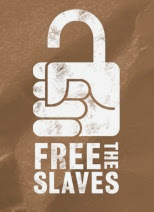 There is another possibility, however, and this is admittedly speculation. 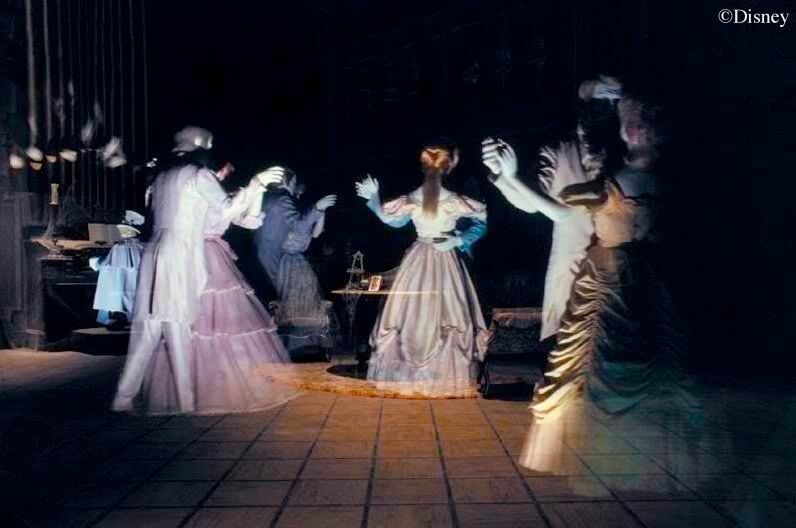 A form of this effect was eventually used—at Phantom Manor, in Paris. (And, I might add, you can find it other places: the Cheshire Cat in the mirrors in The Mad Hatter shop and Mickey in a magic mirror in his Toontown house, both at DL.) 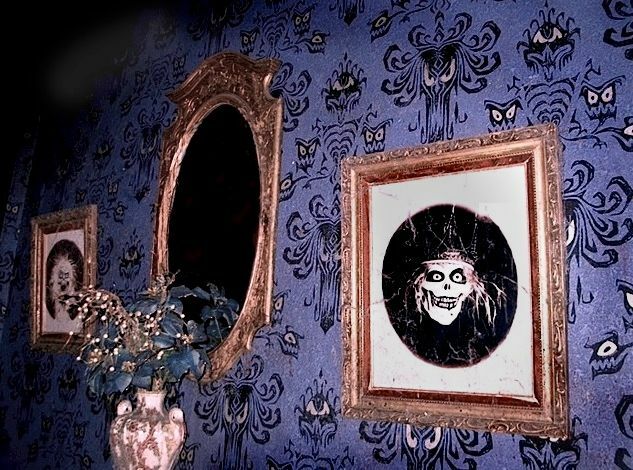 One can't help wondering if, by some small chance, the missing DL door was deliberately omitted, and the innocent looking mirror now hanging there was actually intended for something much more sinister, but the gag was scrapped for some reason or other. 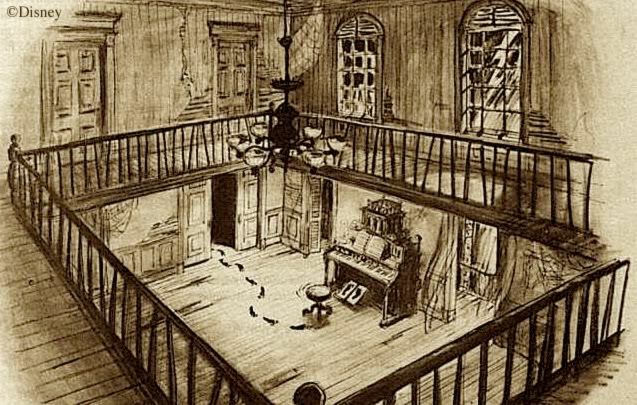 It is a tribute to the Haunted Mansion (and to the geekiness of its fans, I suppose) that a trivial find like this one engages the imagination. I doubt that a missing door in It's a Small World would get blogged anywhere. But the Mansion Imagineers have created an environment that encourages you to enjoy the illusion of a house that's more than a house, one that's almost alive. 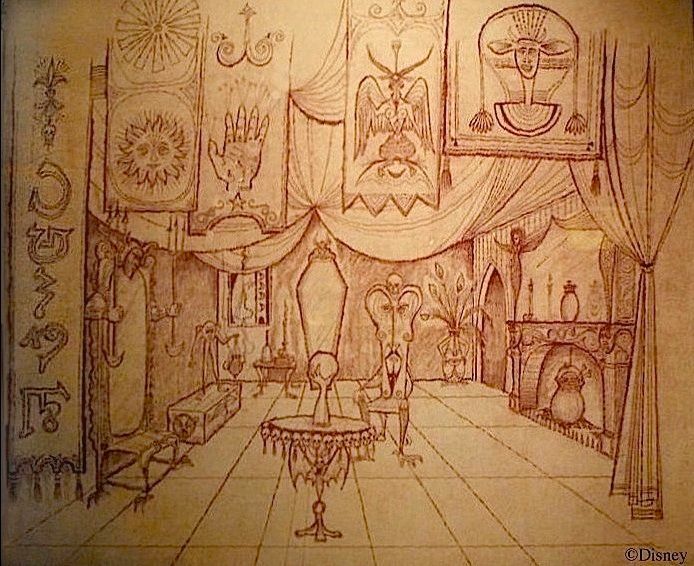 Looking at some concept art, you can see just how far Imagineers like Claude Coats were willing to push the surreal nature of the building itself. 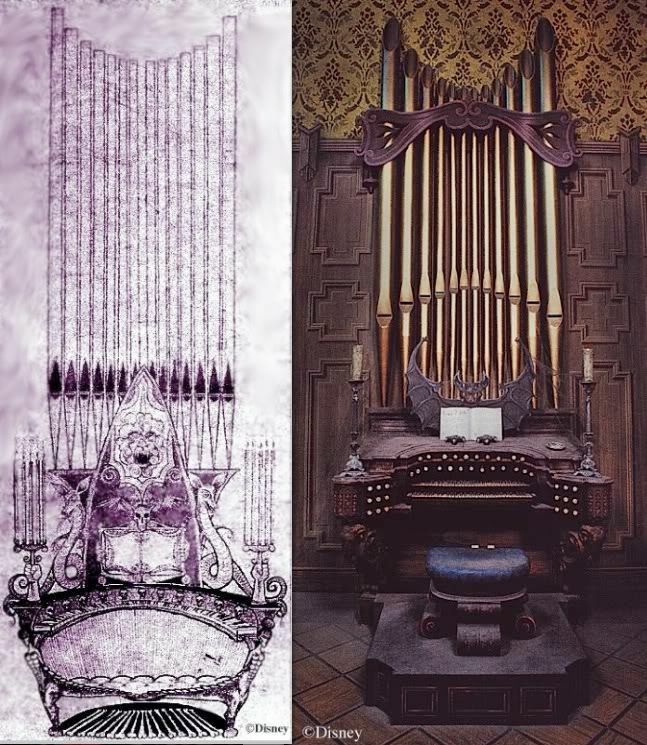 A couple of posts ago I mentioned the well-known fact that the organ in the Disneyland Haunted Mansion's ballroom is the same one used in 20,000 Leagues Under the Sea. You can get that bit of trivia at any ol' blog; Long-Forgotten readers demand more. More ye shall have, and yet with no more calories than with those regular Haunted Mansion blogs. It's amazing. Harper Goff was a Disney genius of the first water. It was he who designed the Nautilus and all of the sets for the classic 20K film. 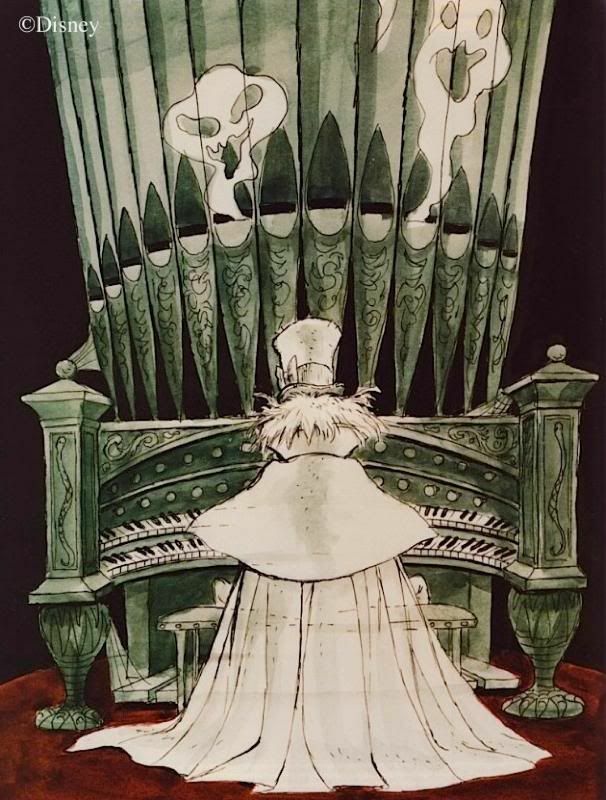 One prop that gave him some trouble, however, was Captain Nemo's pipe organ. The normal procedure was to go to the usual prop houses and arrange for an organ transplant to the 20K sets. But he couldn't find anything suitable, so in desperation he began scouring the classified ads in the local papers. He lucked out. Some guy not too far away had an organ console in his garage that he was willing to unload for cheap. 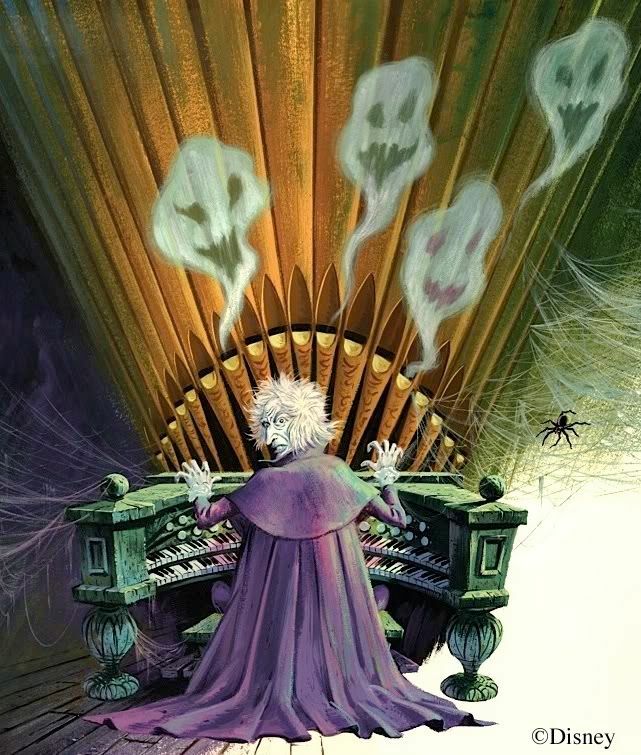 When Goff saw the instrument he was delighted, because not only was it a handsome piece, but it had all the stop tabs and keys intact (a rare thing with old junked organs). The owner was pretty tickled as well: that idiot from Disney paid him a cool $50 for an old organ console that didn't even work. Decked out with a nice set of fake pipes (reportedly, plaster covered with gold leaf), the prop served its purpose, and when the 20K sets were put on display in a Disneyland Exhibit, the organ was a crowd pleaser, judging by the number of photographs around. 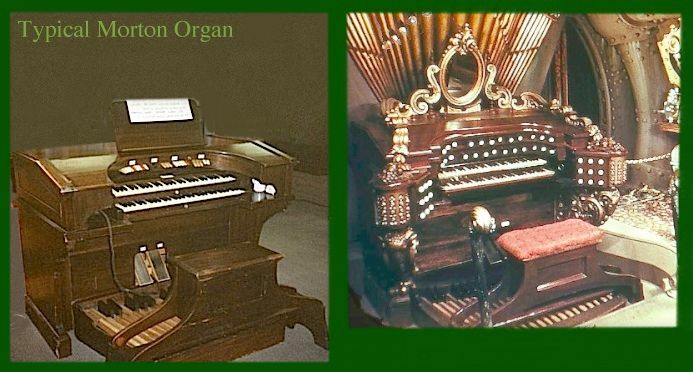 In May of 2014 reader Jonas Clark alerted us to several new details in the story of the 20K organ. It turns out that they did quite a bit more than just sticking a mirror and some pipes on the console. It was a Robert Morton electric theater organ, and like all such electric organs it did not have old-fashioned pull stops but color-coded tabs. 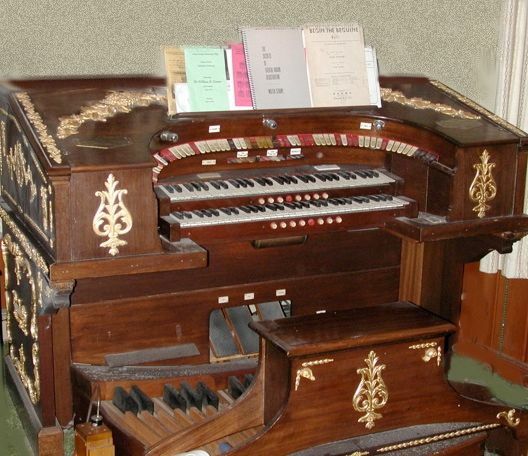 2 manual organ and may themselves have been add-ons, including, one supposes, the ornate corbels beneath them. In short, Goff's lucky find was modified much more than we have usually assumed before it was ready for the Nautilus. On, now, to the Mansion. 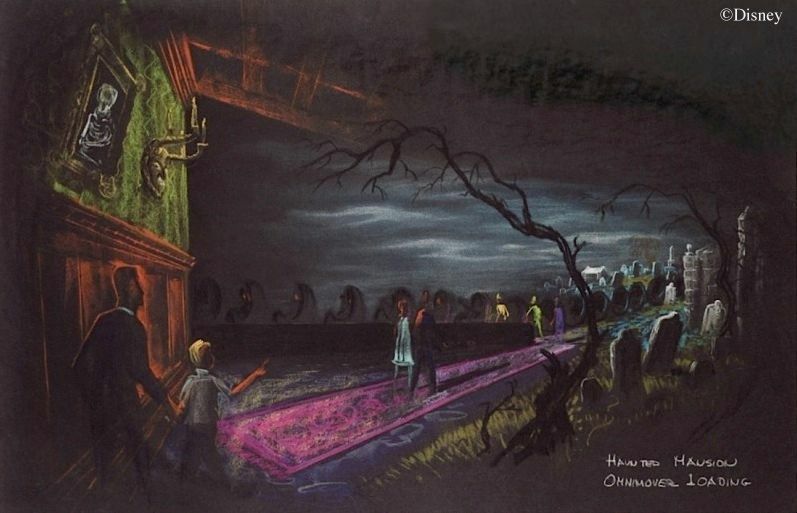 Three years after all this Ken Anderson was given the assignment of designing a Haunted House for Disneyland. His plans always seem to have included a ballroom with an organ in it, played by an unseen organist, and viewed from a balcony. 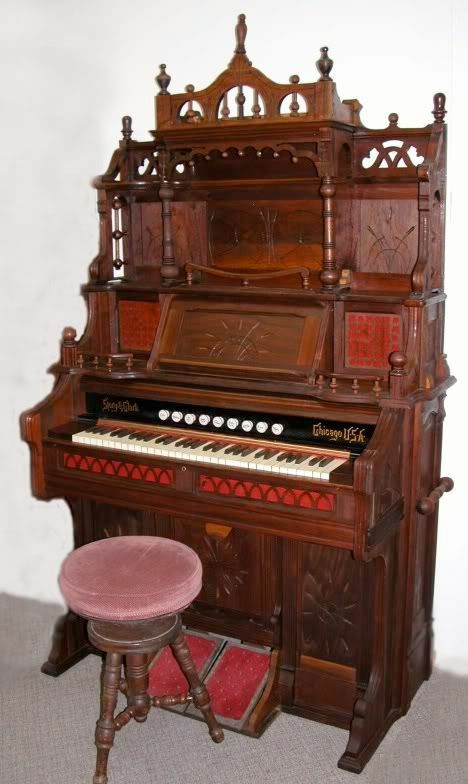 For the organ itself, he was happy with an old-fashioned pump organ, a popular fixture in wealthy Victorian houses. 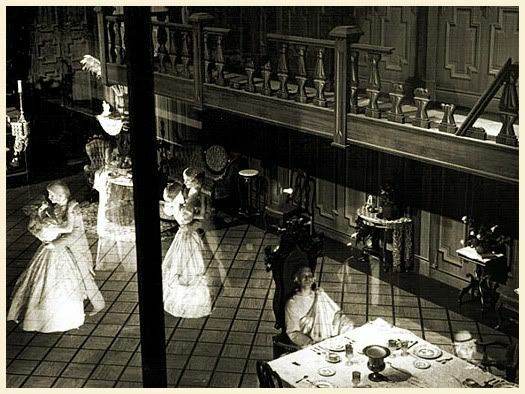 The Imagineers responsible for creating the actual Haunted Mansion gave numerous interviews over the years in a myriad of publications, especially Rolly Crump, X Atencio, and Marc Davis. It is curious that in the published comments, rarely do they mention Ken Anderson and his pioneering labors in 1957 and 1958 on what would eventually be the Haunted Mansion (X does mention him at least once). I have to think this is a fluke rather than a snub, perhaps the result of the questions asked and the material discarded in the editing process. Whatever the reason, it took a long time for Anderson's contributions to be fully appreciated. (There's a string of posts devoted to Anderson coming up, starting HERE.) 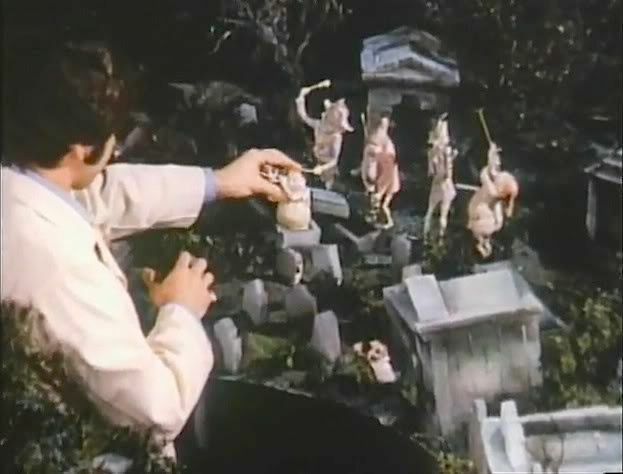 I'm pointing it out now because you will never find a clearer example of how later Imagineers made direct use of Anderson's ideas than this organ gag. 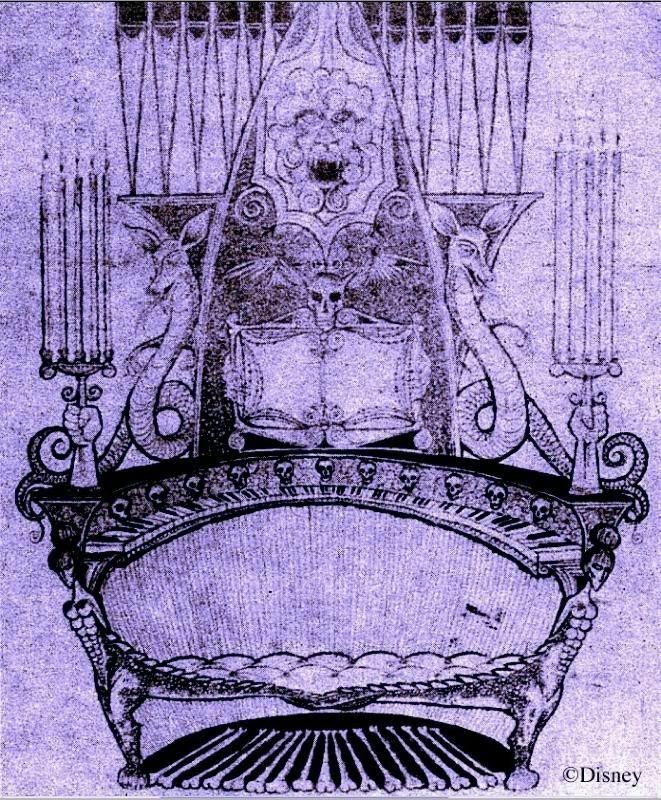 Although the sketch above doesn't show it, Anderson eventually conceived of a number of other instruments in use along with the organ, floating around the room. 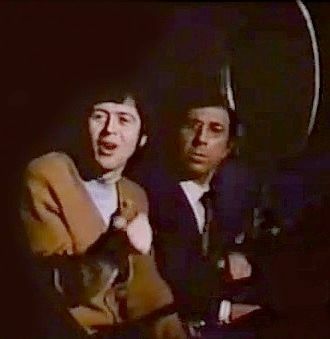 That gag was used too, but it was transferred to the Séance circle. 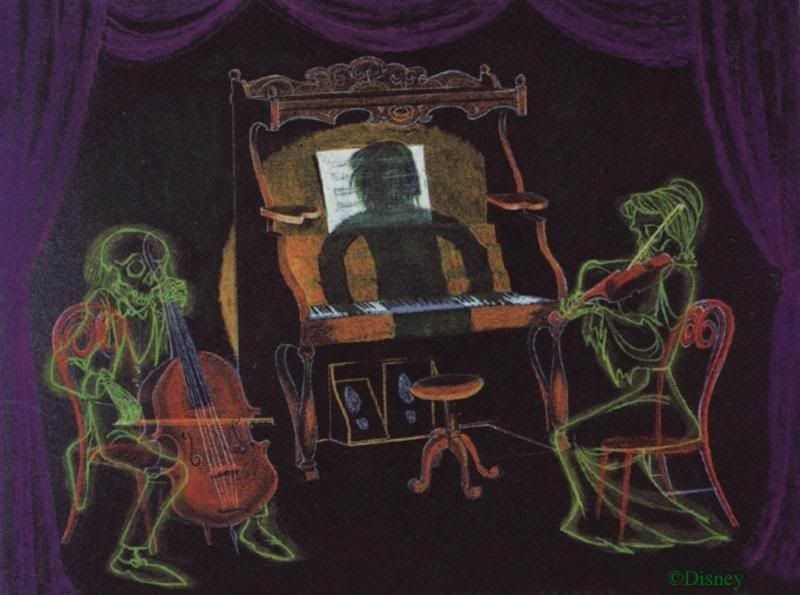 Meanwhile, Anderson's pump organ with its ghostly musician leaving his footprints on the pedals was taken over wholesale by Claude Coats and by X Atencio, along with an ensemble of other musicians. 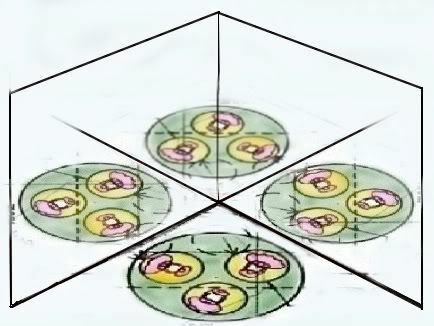 Davis's sketch is a good illustration of the evolution of an idea. 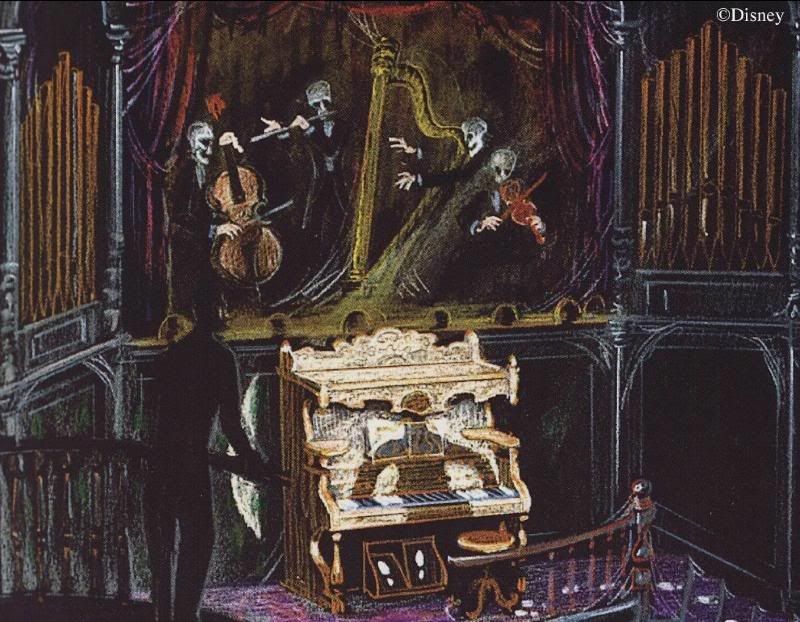 Notice how Marc borrows Anderson's original concept and borrows too the shadow organist innovation from Coats and/or Atencio, and then as his original contribution changes the organ style to one with the pipes prominently attached atop, taking the gag one step closer to what we see in the eventual ride. Meanwhile meanwhile, another Imagineer had ideas of his own. 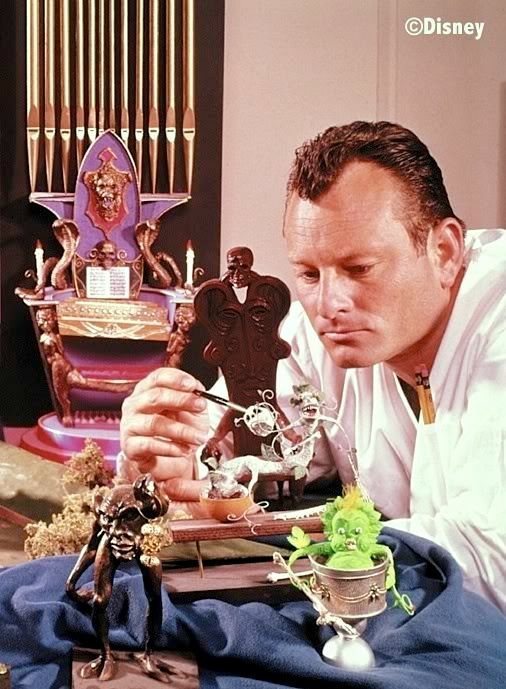 Walt Disney personally recruited Rolly Crump to work on the Haunted House in 1959 because he recognized in Rolly a wild and original imagination with a penchant for the weird and fantastic. That quaint old pump organ didn't really suit Rolly, who felt that it was important to present guests with things they had never seen before. Rolly's organ console was, you might say, a little unorthodox. No matter how much the other Imagineers might balk at Rolly's ideas as "too weird," Rolly held a trump card: Walt loved his stuff. 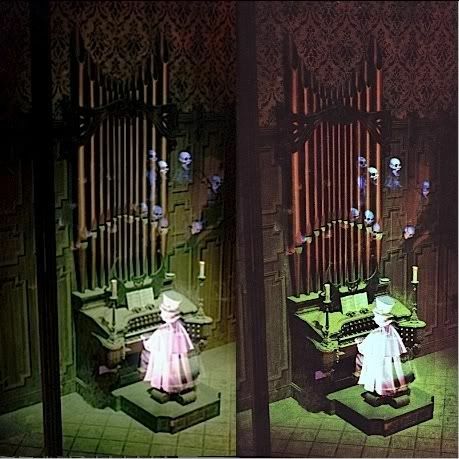 When Rolly built a small model of this organ, that was the one Walt used to demonstrate the Pepper's Ghost effect for viewers of the television program celebrating Disneyland's tenth anniversary in 1965. 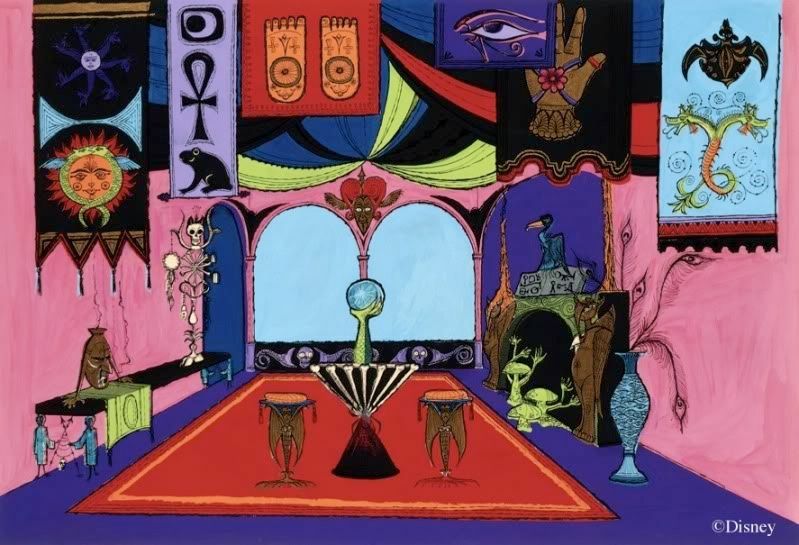 Walt decided to put Rolly's surrealistic material into a "Museum of the Weird," separate from the Haunted Mansion proper. But what about the ballroom organ? What's it going to be guys, this crazy thing or the more staid Anderson-Coats-Atencio pump organ? 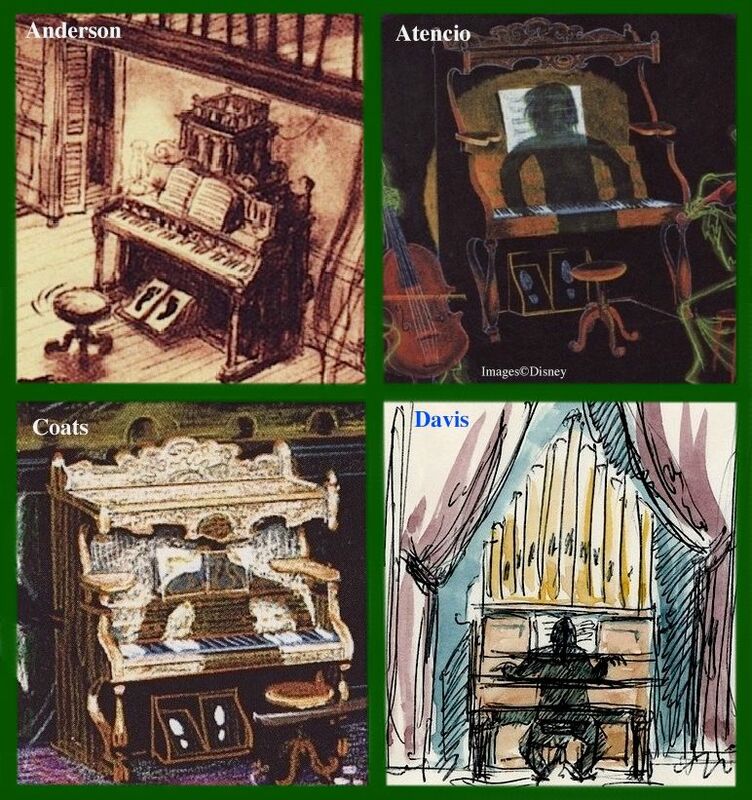 Or are there going to be two pipe organs in the attraction? 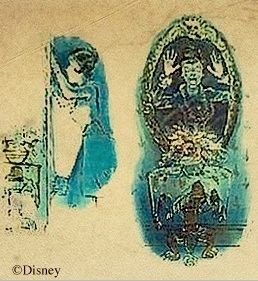 Walt's death in 1966 left questions like that without a supreme arbiter, but in this case, the question answered itself in that same year when the old 20,000 Leagues exhibit permanently shut down and work began on an all-new Tomorrowland. 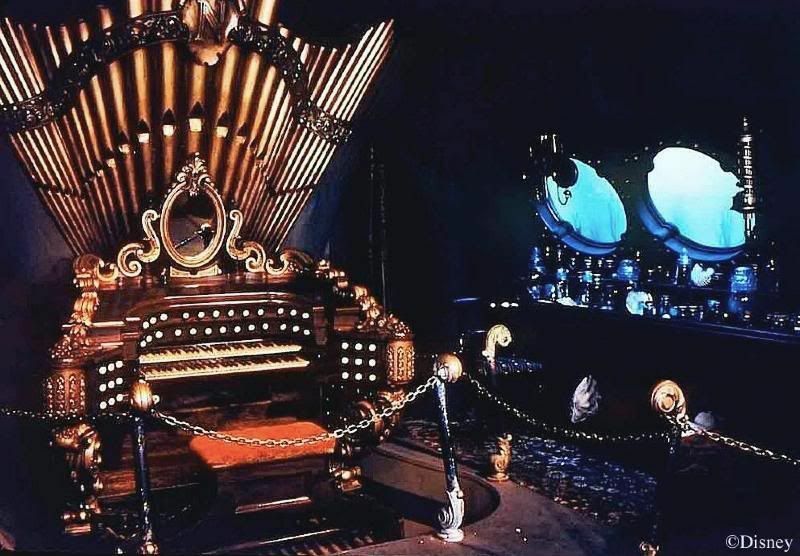 Somebody realized that the Nemo organ was now available, and it was probably an easy decision to save a few dollars and some time by grabbing it for the Mansion. So much for the pump organ. 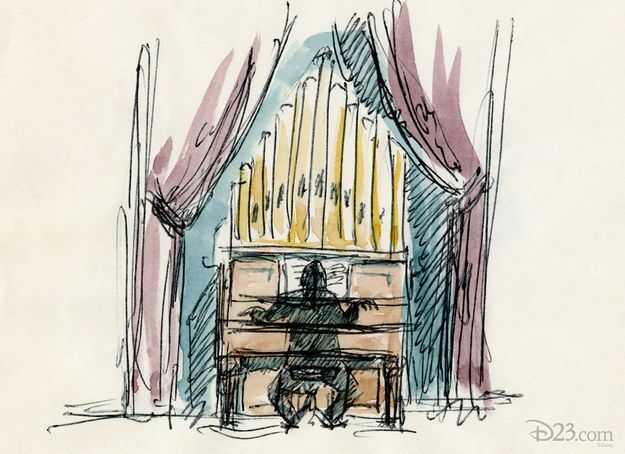 When Marc Davis sketched this concept for the organist, he seems to have had the Nemo organ in mind, judging by the fan-shaped organ pipes. But the Nemo pipes were made of plaster, and the big "N" medallion wasn't something you could just snap off. Besides, if they just plopped the same organ into the HM ballroom that had been on display in Tomorrowland for over ten years, plenty of guests would likely recognize it for the salvage job that it was. 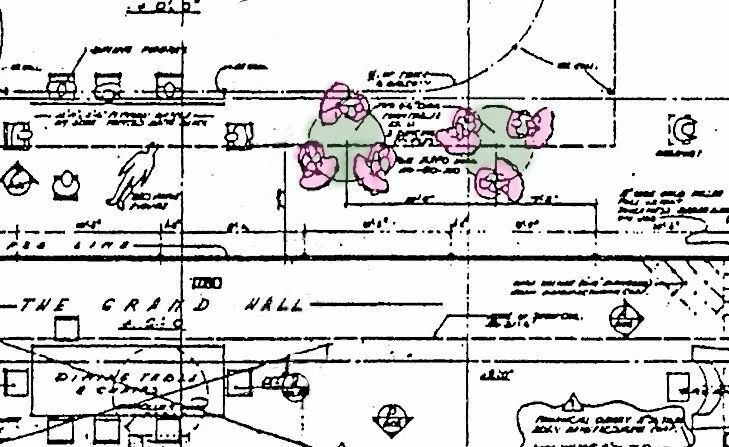 The solution, of course, was to design a new set of pipes, and ta da, it was Rolly Crump's old design that came to the rescue. That pipe set remains the single largest survivor from Crump's disused "Museum" designs to make it into the finished HM. The rest is details. What happened to the other musicians? 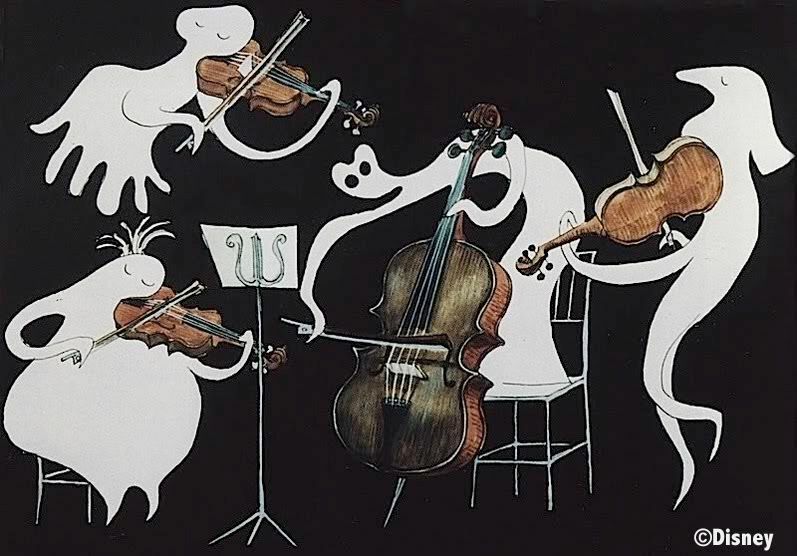 Marc Davis liked the idea of a ghostly musical ensemble, but he conceived of it as having its own tableau rather than as an adjunct to the ballroom organist. When this tableau was nixed, there went what once was going to be the organist's companions, and he became a solo artist. 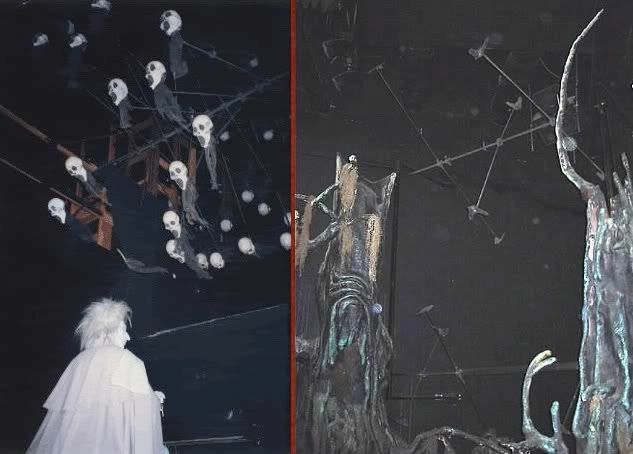 Another Davis idea did survive, though: the banshees floating out of the organ pipes. Very cool. 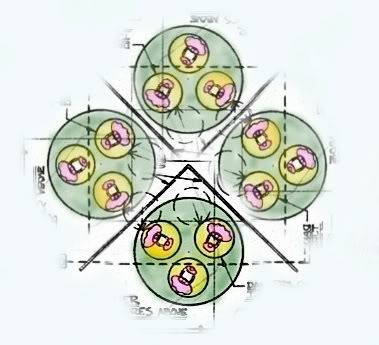 The cloudy spirits were solidified into skull-like heads, and the practical effect was simply a ferris-wheel device, reflected spookily in the glass. 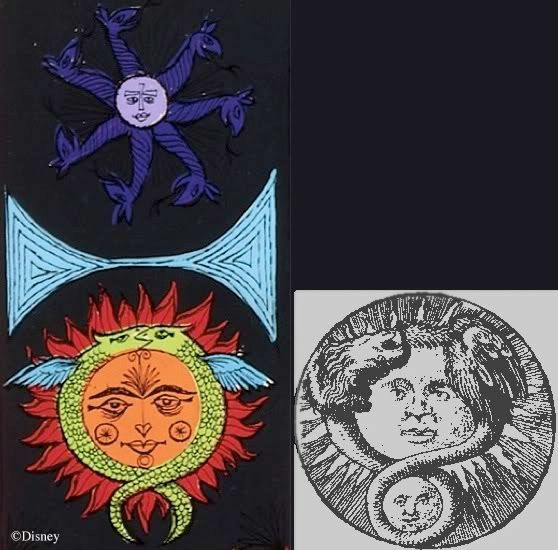 This device may possibly have been inspired by the bats flying around in the forest scene in Snow White's Adventures, over in Fantasyland (although it's not certain that the bats are original). If correct, this would not be the first nor the last borrowing from the park's original scary dark ride. 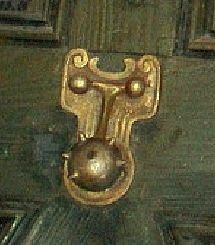 The end result is one of the Mansion's most memorable characters. In glorious 3D for ya, once again. Only the DL organ is "real." The WDW and Tokyo organ consoles are simply plywood mockups, modeled on the original. 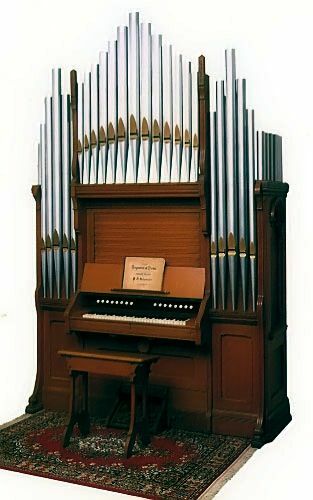 Between the 20,000 Leagues movie and the DL Haunted Mansion, that original instrument may be the most frequently viewed pipe organ console of all time. I wonder what that guy did with his fifty bucks? The easy—and correct—answer to that question is, "Some are, some aren't." 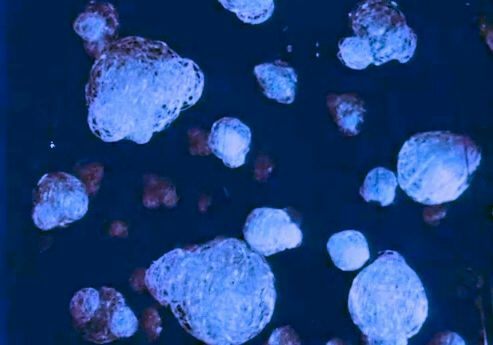 Since once in awhile an argument hinges on whether or not some random detail in the HM is the result of pure geekiness, it's helpful to demonstrate that the phenomenon really is there. I think a good example can be seen in the attic scale model photos that we've referenced more than once already, comparing them to what is actually there. As many of you know, they build a scale model of the whole attraction beforehand and photograph it to death, using this as a tool for interior design, finding unforeseen problems in presentation, fine-tuning arrangements of group figures, etc. The photos are not generally intended for public consumption, although many do eventually get published in various Disney books and magazines. They're fun to look at, no doubt about it. 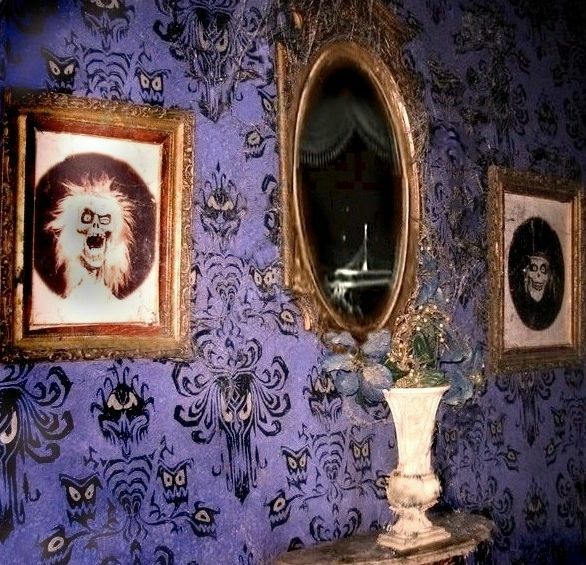 Anyway, it seems to me that the Imagineers who revamped the attic contents for the Constance overhaul in 2006 were Haunted Mansion geeks. They went back to the old scale model photos and incorporated details from them that the public could not possibly be expected ever to notice. 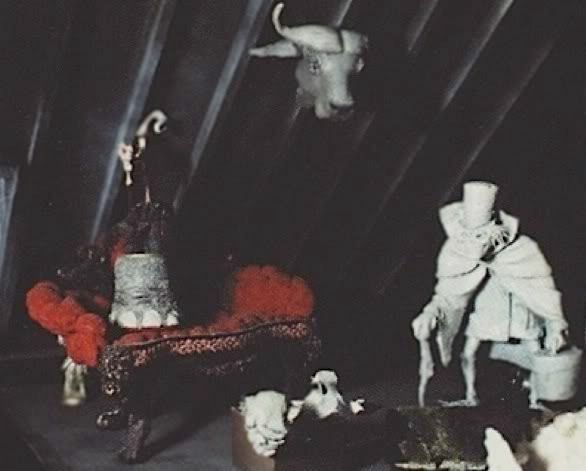 This 1969 shot of the Hatbox Ghost corner of the attic model has some curious props in it. 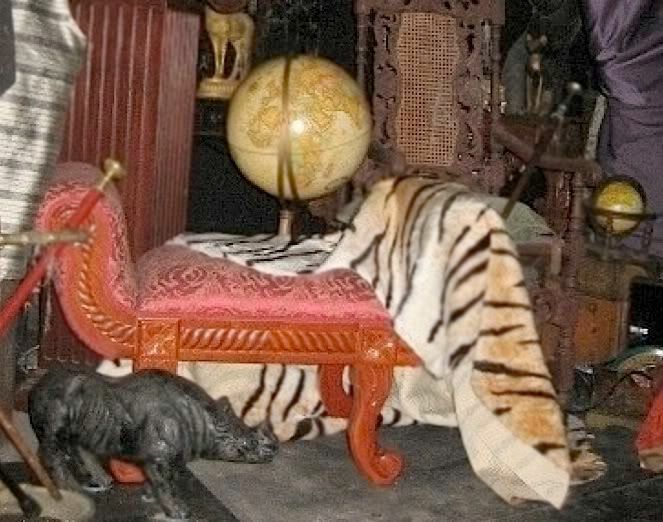 There's an unusual red couch of some kind and some items suggesting the presence of a Victorian-era big game hunter: a water buffalo head and an elephant's foot umbrella holder. Notice also that this tableau has two globes in it, which seems like a bit of overkill, doesn't it? Why have two of them so close together? Compare this scene with its counterpart in the scale model, and the global mystery is solved by another appeal to the geek factor. 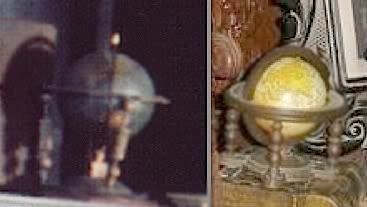 It turns out that the smaller globe is placed almost exactly where its miniature twin sits in the old photo. Someone might argue that this is a coincidence, but after the example of the big game hunter's red couch, I'm inclined to think it's deliberate. If the responsible parties ever happen to click on "Long-Forgotten" and read this post, all I can say is . . . 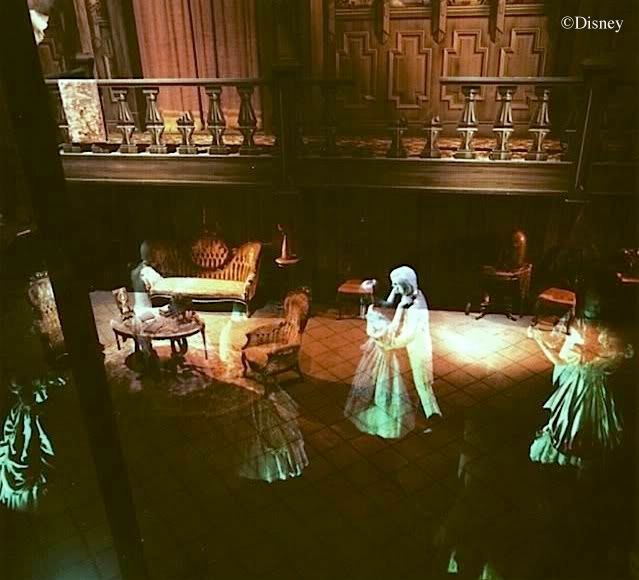 The Grand Ballroom scene is the Haunted Mansion's masterpiece, a jawdroppin', show-stoppin', eye-poppin', head-choppin' (Connie! get out) spectacle, and it's not surprising that some amusing trivia has come out of there. 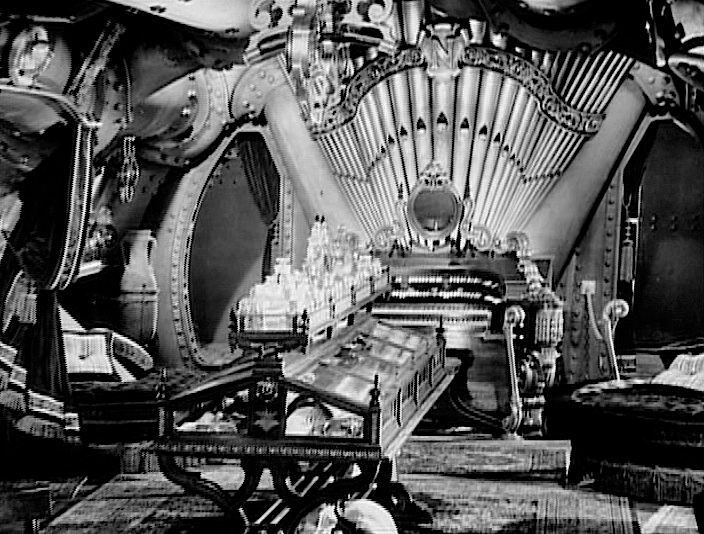 Everyone knows that the DL organ console is Captain Nemo's, a prop from the 20,000 Leagues Under the Sea movie. 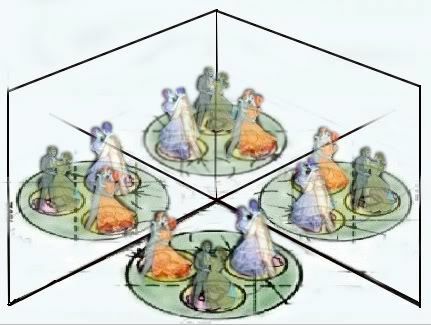 Another bit of trivia that's fairly well known is that they failed to take into consideration the fact that the figures are reflected—and therefore reversed—and so the ballroom dancers depict the ladies leading the men, which is no doubt gratifying to someone with feminist inclinations ("See? In the afterlife they finally wise up"), but it's generally regarded as an embarrassing goof. "I screwed up," admits sculptor Blaine Gibson, with characteristic modesty. Actually, dancing etiquette was the least of the problems they had with the dancers. They almost had a disaster with this effect, but that bit of trivia has lain quietly hidden. Sometimes something is "long forgotten" because someone swept it under the rug and hoped that it would be forgotten. 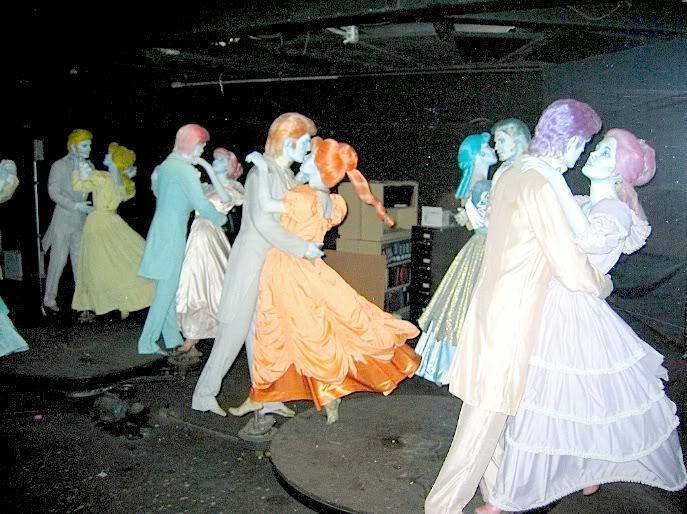 The effect itself is simple, just a bunch of mannequins spinning on turntables (perhaps too simple—Rolly Crump has been known to criticize it as too obvious). 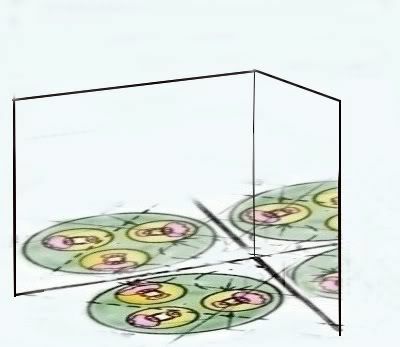 There are six couples in all, two sets of three on two adjacent turntables. The blueprints tell the story. 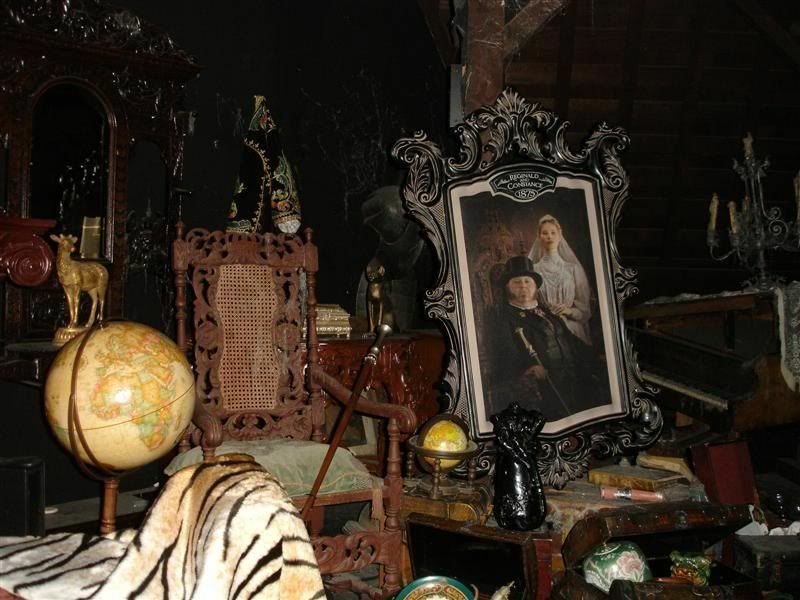 They store junk anywhere and everywhere inside the HM's. 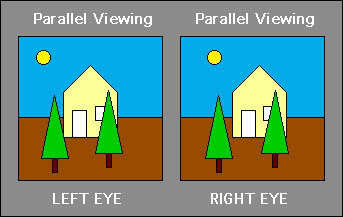 Hey, if the guests can't see it, it doesn't exist. Some party. Looks kinda lonely out there. Yes I know that the figures aren't reflecting themselves accurately in the mirrors. This a rough sketch, just to give you an idea. It actually looks pretty good. I set up three chessmen on a phonograph turntable and grabbed a couple of mirrors, and it wasn't hard at all to visualize twelve couples gettin' down to that funky sound.
. Whoops, wait a sec. We forgot to put up the mirrors. You know, I sure hope they figured this out before they ordered those huge, expensive mirrors. There is no sign of the mirrors in the publicity shot or the film footage we looked at above, but I suspect that they knew by then that they had a little problem here and a second turntable with another three couples was in the works. Maybe it was not yet built or not yet installed. The thing is, they were still counting on the mirror effect in April. That's when the blueprint above was done. That means that there was a maximum of four months (and possibly much less than that) for them to (1) notice the problem, (2) kick themselves for being so stupid, (3) come up with a solution, and (4) build and install it. By comparison, Blaine's little "screw-up" with the ladies leading the men was small potatoes. And here y'go, darlin', or as Émile would put it, Voilà. 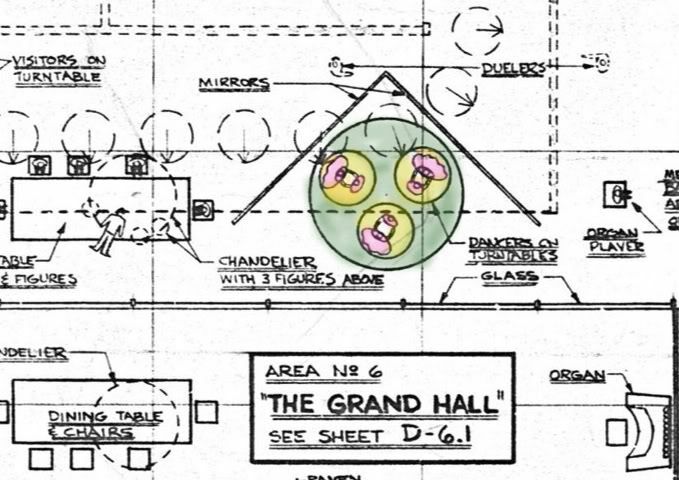 Here's another example, taken from a different sketch of the Museum. 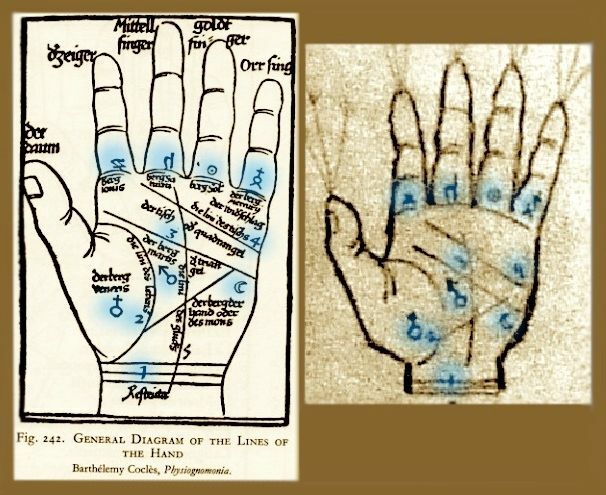 Rolly borrowed an old palmistry chart in de Givry.